Hydration is a key part of our daily wellbeing and as many of us know it is recommended that we drink of 2 litres of water per day, however for some, drinking enough water can be a challenge, as it can be bland and boring. According to a recent survey conducted by the Royal National Lifeboat Institution (RNLI), 89 per cent of us drink less water than the recommended daily amount. RNLI revealed that one of the main reasons why people aren’t drinking enough water is because they would prefer to be drinking fizzy drinks, juices and energy drinks, which often contain high levels of sugar. However, with the introduction of the sugar tax, it is leading to a total rethink of soft drinks right across the out of home market. The impact of the sugar tax ties in with consumers seeking out new, healthier options and looking for new experiences. 57 per cent of all drinking occasions are cold, and ‘Cold Brew’ is currently the top trending beverage search online in the UK. Cold, all-natural and sugar-free is hot right now! 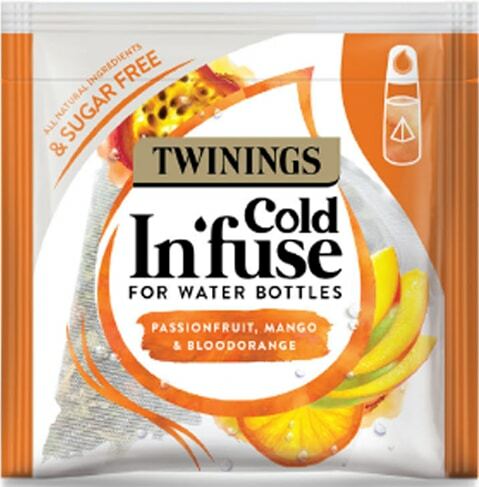 Our supplier Twinings are thrilled to showcase a new innovation which makes drinking your daily intake of water easier and more enjoyable without the high levels of sugar. Their latest drinks innovation is set to shake up the water and soft drinks category. 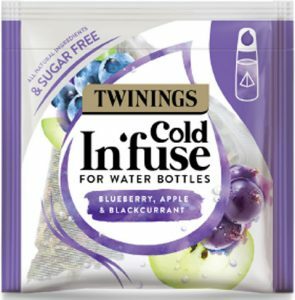 Introducing, the new Cold In’fuse range from Twinings, which is an expansion to their current tea selection. They’ve created three new flavour combinations, which are specifically designed to infuse directly in cold water. The natural ingredients are heat-treated, which means they are safe to drop straight in to cold still or sparkling water. Bringing just a hint of flavour to your beverage, the Twinings Cold In’fuse range has made it simple for those looking to liven up water in a hassle-free way; no fuss, no mess, simply drop and drink. This innovative technology opens up a world of opportunities for operators looking to offer craft beverages with operational simplicity. Here are some of the ways in which Cold In’fuse can bring a profitable addition to your menu. With over half of young adults using a water bottle every day, the opportunity to make profit from water consumption has never been greater. The availability of refill water stations continues to grow in response to consumer demand. The Cold In’fuse bags can be sold individually so consumers can add it directly in to water bottles for on the go hydration. Merchandising is available to site within chiller units or directly at till point to encourage profitable water sales. Ideal for workplace sites to increase profitability from water bottle sales or hydration station refills. 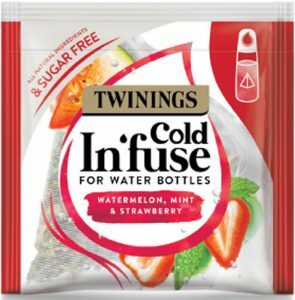 Cold In’fuse can also be added to water hydration stations for a natural fruity flavour. This offers great tasting drinks without the need for operators to prepare additional fruit or herbs. 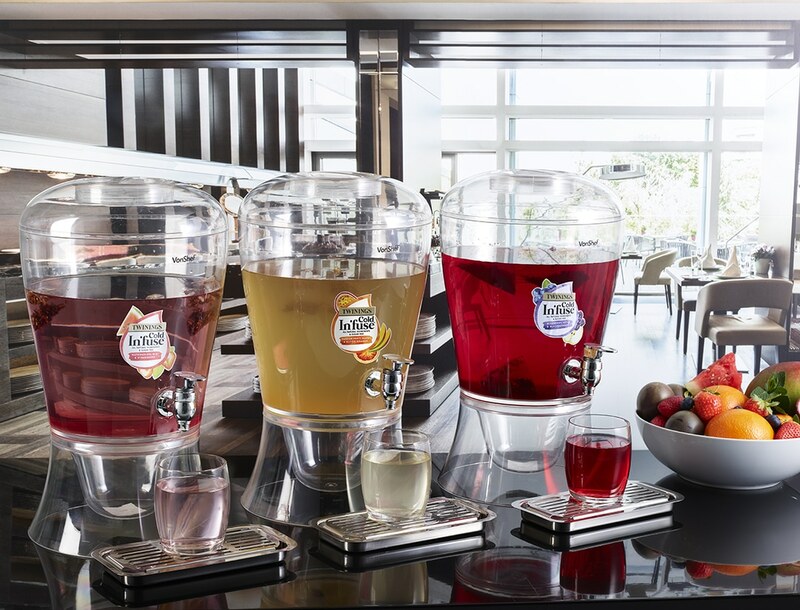 It delivers a consistent serve every time and makes hydration stations a destination in hotels and workplace settings. 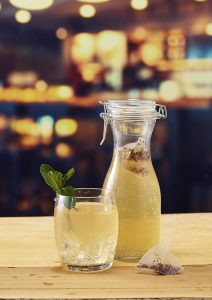 With many consumers defaulting to tap water in restaurants due to lack of healthier beverage choices on menus, Cold In’fuse can be added to still or sparkling water, a great way to create a new menu of sophisticated, natural and sugar-free soft drinks. Twinings recommend serving the drink with a garnish of fruit and served over ice. Still, Sparkling or In’fused anyone? For more information on the Cold In’fuse range from Twinings, please contact Bunzl Catering Supplies today.